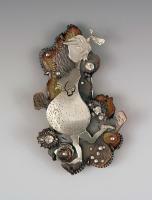 Amanda Outcault is a local painter and metalsmith. She has exhibited in Virginia, North Carolina and Ohio. She had 3 paintings on display at the Contemporary Art Center's Head, Shoulders, Knees and Toes Exhibition. Outcault's website, here, has all of her work on display. Amanda Outcault describes her artworks as showing the changing roles of women. She says that some of her work describes finding something magical in the ordinary tasks. One of the elements of her paintings are the use of goldfish as a symbol. Outcault says they can show both the meanings of abundance and happiness, but also of domestication and entrapment in small spaces. She is inspired by life and her environment. Paintings I saw at the CAC: Fredrick and Friends Accompany Manda On A Bathing Adventure, Manda Pauses the Calorie Count, and Lauren and Danielle Wonder what Happened to the Cookies. 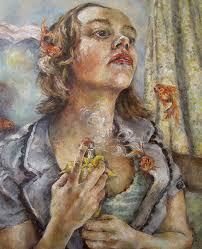 I loved her paintings that were on display at the CAC because of the goldfish. There was so much wonder and excitement in them. I could really feel the beauty of life in the everyday experience.